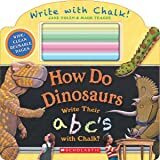 (进口原版) 跟着恐龙学 How Do Dinosaurs Write Their ABC's with Chalk? 5.0 颗星，最多 5 颗星Fun for All Ages! 5.0 颗星，最多 5 颗星Love this book!